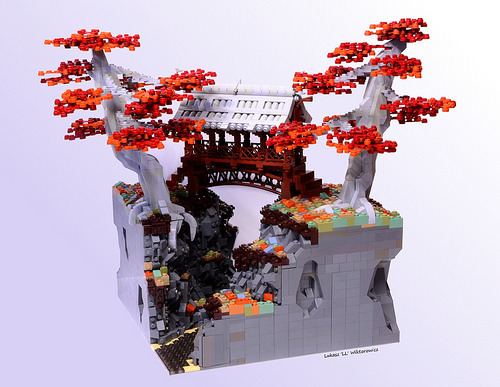 Although there is no snow in this little ravine scene by Lukasz Wiktorowicz, it certainly looks like a chilly day to be on that Asian-inspired covered bridge. The composition and muted color palette of this build are both remarkable. I love that Lukasz ingeniously used the old LEGO rope bridge piece upside down to add a beautiful curve to the bottom of his wooden bridge. But my favorite details are the roots and autumnal leaves on those stunning gray trees.